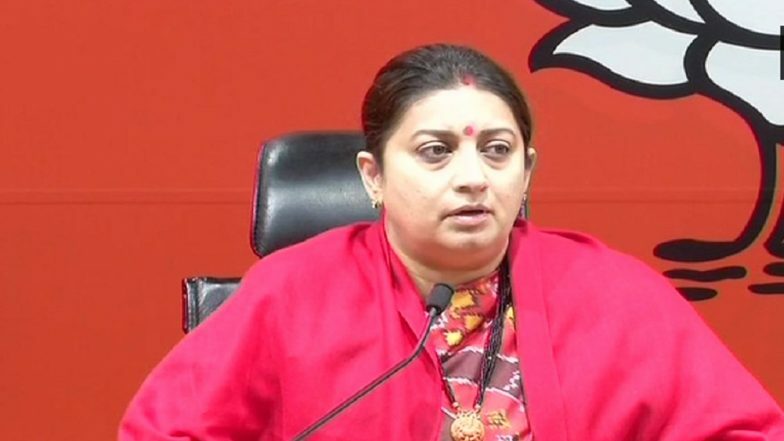 New Delhi, April 12: Union Minister Smriti Irani on Thursday, April 11, filed her nomination as Bharatiya Janata Party (BJP) candidate for the Lok Sabha Elections 2019 from Amethi. With the filing of her 2019 affidavit, Irani seems to have ended a long debate on her educational qualification. In her current candidate, Irani declared that she has "not completed" Bachelor of Commerce (Part-I) — a three-year degree course — from Delhi University's School of Open Learning in 1994. There has been a debate on whether Irani was even a graduate or not, more so, because she was the Human Resources Development (HRD) Minister from 2014 to 2016 in the Narendra Modi government. Amethi Lok Sabha Constituency in Uttar Pradesh: Candidates, Current MP, Polling Date and Election Results 2019. In 2004, Irani had declared herself as a BA graduate (1996) when she had filed her nomination from the Chandni Chowk seat. However, in 2009 and 2014, Irani declared her education as B.Com Part-1, School of Open Learning (Correspondence), University of Delhi (1994). After she took charge as HRD Minister in 2014, a case was filed against Irani for making contradictory claims about her qualification. The case was dismissed by a Delhi court later. The court said that the plea was meant to "needlessly harass her". The petitioner had challenged the verdict in Delhi High Court. Meanwhile, in her school education, Irani has written her examination as "All Indian Senior Secondary School Certificate Examination". The former HRD minister and now Textiles Minister seems to have made a typo error here as AISSCE is All 'India' Senior Secondary School Certificate Examination. Smriti Irani has filed her nomination from Amethi for the Lok Sabha Elections 2019. She is set to face Congress President and 3-time Amethi MP Rahul Gandhi. Gandhi has declared his educational qualification as M.Phil(Development economics), 1995, Trinity College, Cambridge University. Voting for the Lok Sabha Elections 2019 in Amethi of Uttar Pradesh will take place in the fifth phase on May 6. The counting of votes will take place on May 23.